-Has a tendency to dribble with head down and drive into brick walls. Take questionable shots early in the shot-clock. Outlook: Canadian shooting guard who goes to high school in Utah. 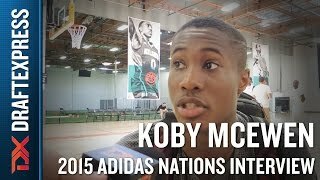 Had a very strong showing at adidas Nations, scoring 30 points per-40 on very good shooting percentages. Displayed better potential as a jump-shooter than he had in other settings, but on a very small sample size. Aggressive player on both ends of the floor. Will be a very good college player. Needs to continue to round out his game to be considered more than that.